Kervansaray Kundu Hotel is an all-inclusive, family friendly hotel only a short drive from Antalya city centre. 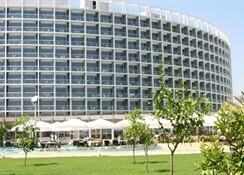 This Beach-Front Hotel facing Lara Beach, impresses with its unique pool, large garden and numerous guest facilities. The hotel's restaurants serve up delectable dishes to cater to the palate of guests. 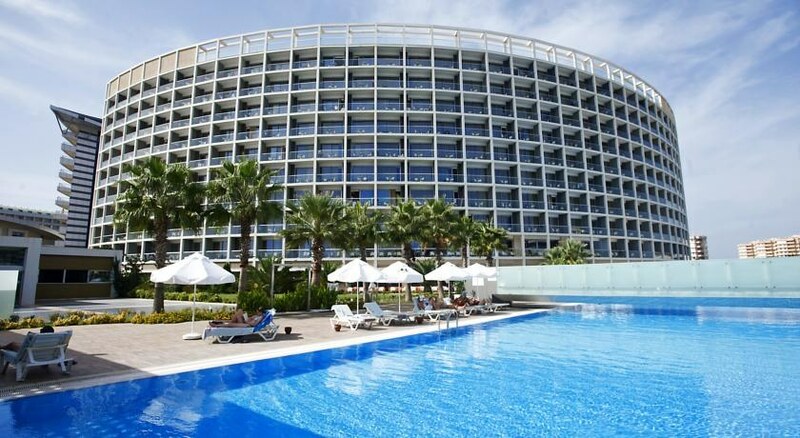 With 400 well-appointed guestrooms that have attached balconies offering great views of the Mediterranean and offering a comfortable stay, this hotel is an excellent choice if you wish to enjoy a fun-filled holiday on the sunny Antalya coast. The nearby beach offers an exciting array of watersports. The rooms come with complimentary Wi-Fi access. Kervansaray Kundu Hotel is located a short drive from Antalya city centre in a beautiful beachfront facing the Lara Beach. 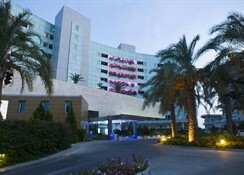 This is in a quiet part of town and Antalya International Airport is 15 km from the hotel. 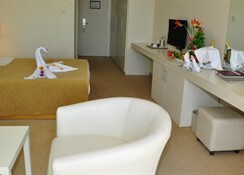 The hotel offers a total of 400 rooms for its guests. 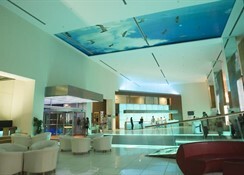 The hotel has interesting and contemporary architecture, blending in with the surroundings. 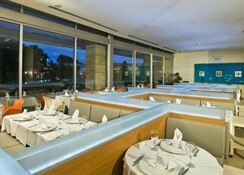 Kervansaray Kundu Hotel has several rooms to suit guests’ requirement of taste and space. Rooms have contemporary furnishing and all modern amenities like air-conditioning, heating, safe, en-suite bath and furnished balcony. These come in types of standard single, standard double, triple and family rooms. Kervansaray Kundu Hotel’s guests can try out various watersports at the beach next door including canoeing, diving and parasailing. There is a fitness room and an indoor pool for those who wish to stay active. Tennis enthusiasts can play at the on-site court. The hotel hosts various dance groups, magicians and other artists. For tiny tots there’s all-day animation and a mini-disco. Guests can relax with drinks at the pool bar, beach bar and disco bar. There is also a piano bar with soothing live music. After a scare with the fact we have 2 hotels within a mile of each other. I was delighted to find the kervansaray kundu was nicer than the other one. We went there as a group of 8 friends and we had amazing time there. I would say that the resort is not a true 5 star but can be graded as a good 4 star. If you fussy about food and room spaciousness then probably avoid this resort. But if you love to do the different activities within resort then I will recommend this place highly. Huge outdoor swimming pool, indoor pool, children pool, Jacuzzi, amazing water slides, water volley ball sports and a beautiful private beach with mesmerizing views from its wooden deck. Also all type of water excursions such as parasailing, speed boating and so on are available in very reasonable price. The resort is located ideally to many local markets for any possible shopping you want to do while staying there. We have enjoyed our stay there and I can recommend this resort for any traveler who want to enjoy outdoor activities. White it's certainly not a 5 star hotel - the service, food and drinks come close. Nice, clean rooms (all be it a little tatty around the edges) plenty of good food choices, 24 hour bar in the piano bar (all inclusive still!) and staff that, in the main, could not do enough to help you! We had a wonderful time at Kervansaray Kundo and would not hesitate to recommend it to anyone looking for real value for money! If you're looking for a cheap, all-inclusive holiday with plenty of sunshine - look no further!